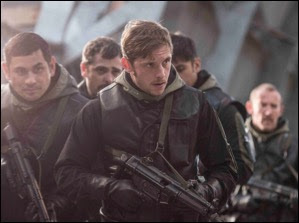 Directed by Toa Fraser, and starring Jamie Bell, Mark Strong and Abbie Cornish, the film was shot on location in London, in and around Knightsbridge. The screenplay was written by acclaimed screenwriter Glenn Standring after extensive research and interviews with various individuals who played a key part in the days leading up to, during, and after the Embassy siege. The framework for the film largely follows the perspective of three people who played a vital part in the events at the time – hostage negotiator Max Vernon, the man responsible for communicating with the terrorists inside the building; news reporter Kate Adie, who was covering the events for the BBC and Rusty Firmin, leader of one of the SAS assault teams that entered the Iranian Embassy to end the siege. For 6 days, the whole country stopped still and looked on as a tense standoff played out between the British security forces and armed militants, culminating in a dramatic and brutal assault. This film is described as a definitive inside account of a historic military operation, where for the first time ever the public witnessed the incredible bravery of the Special Air Service (SAS) in action. 6 Days will release across the UK, Ireland 4th August 2017.